Blanched Almond Flour, made with California Almonds, direct to you fresh from the farm. Our website prices almonds by the pound. The more you buy, the less you pay. Just Almonds uses the freshest almonds to create our almond flour and almond meal. Orders may take up to 3-4 days to ship pending weekends, holidays, and stock. Express options are available, please call to ensure a timely delivery. Note: Quantity discounts shown above will be automatically applied to your order. Please call our in-house Sales Manager John T. at 775-624-9062 for orders over 500 lbs. Almond flour is most often made with blanched almonds (no skin), whereas almond meal can be made either with whole or blanched almonds. Consistency is more like corn meal than wheat flour. For the most part they can be used interchangeably. If you're looking for almond flour, click here. Almond flour is very nutritious, easy to use and readily available. It’s also a great alternative for those of us who need to watch our glycemic index. Almond flour is high in protein, low in carbohydrates and low in sugars. Unlike other alternatives to wheat flour, almond flour is moist and delicious. Almond flour is far superior to other flours in terms of taste, nutrition and ease-of-use. Almond flour is good in "quick-bread" type recipes, like muffins, nut breads, and pancakes. It's not good for foods such as bread that require a real dough (you can't knead it). Usually, more eggs are required when baking with almond meal to provide more structure. At Just Almonds, we pride ourselves on the quality and consistency of our blanched almond flour. Our blanched almond flour has a more coarse texture, than the standard enriched white flour. Expect tiny bits of almond in the blanched almond flour. Our flours are available natural (ground with skin called Almond Meal) or blanched (ground without skin and white in color, called Almond Flour). 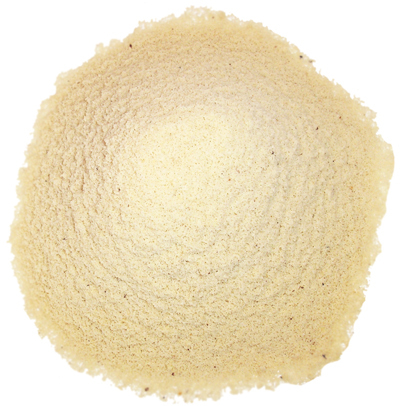 Our almond flour is commonly used in baking, cooking, and nut butter. All of our products are shipped from the current crop and ship directly from the farm without repackaging the product or mixing it with other types of nuts (peanuts for example). The packaging of this product will vary as more than 5lbs can fit in 1 bag. We have 1 lb bags, 5 lb bags, and 25 lb boxes. We are unable to individually package orders. Our almond flour is ground to the finest size possible. We create our almond flour with the freshest crop and best almonds possible. I've ordered the blanched almond flour in the past, but this last time I've noticed an unappetizing taste to the almond flour when I've baked with it. Same as it smells before baking. I can't remember if It was like this before, but don't know why I would have ordered it again.. I don't enjoy the flavor at all and won't be ordering it again. I bought quite a bit, so I'll have to endure it until I use it up. My husband is on the Specific Carbohydrate diet due to his illness and almond flour is the base of much of his food. I have used Just Almonds almond flour for making waffles, doughnuts, pizza dough, pecan pie curst, cupcakes, cake, etc. and it does great! It is cheaper and saves me the time of having to grind the almonds myself. It also makes baked goods fluff up quite nicely compared to other almond flours. Thank you for your product!! !